The aim of this pilot study was to examine whether chair yoga was effective in reducing pain level and improving physical function and emotional well-being in a sample of community-dwelling older adults with osteoarthritis. One-way repeated measures analysis of variance was performed to examine the effectiveness of chair yoga at baseline, midpoint (4 weeks), and end of the intervention (8 weeks). Although chair yoga was effective in improving physical function and reducing stiffness in older adults with osteoarthritis, it was not effective in reducing pain level or improving depressive symptoms. Future research planned by this team will use rigorous study methods, including larger samples, randomized controlled trials, and follow up for monitoring home practice after the interventions. Dr. Park is Assistant Professor, School of Social Work, and Dr. McCaffrey is Professor, College of Nursing, Florida Atlantic University, Boca Raton, Florida. The authors disclose that they have no significant financial interests in any product or class of products discussed directly or indirectly in this activity. This pilot study was supported by the Florida Atlantic University mentoring grant (seed grant). Address correspondence to Juyoung Park, PhD, Assistant Professor, School of Social Work, Florida Atlantic University, 777 Glades Road, Boca Raton, FL 33431; e-mail: jpark14@fau.edu. Osteoarthritis (OA), as a degenerative joint disease, is the most common type of arthritis and a major cause of pain and disability (Burkes, 2005; Centers for Disease Control and Prevention [CDC], 2002; Felson & Zhang, 1998). OA affects 27 million people in the United States, and the incidence continues to increase, particularly with age (Arthritis Foundation, 2012; CDC, 2011; Vitiello, Rybarczyk, Von Korff, & Stepanski, 2009). Thus, OA is a significant problem for the aging population (Peyron & Altman, 1992). Nearly 50% of adults 65 and older have symptoms associated with OA, and approximately 11% are functionally limited due to the disease (Lawrence et al., 1998). Symptoms associated with OA often include morning stiffness, joint pain, limited range of motion, and depression (Kolasinski et al., 2005; World Health Organization, 2003). Older adults with unrelieved knee pain from OA were more likely to need assistance with bathing, dressing, and transferring than those without knee pain, adding to the cost of care for this group (Nishiwaki, Michikawa, Yamada, Eto, & Takebayashi, 2011). Knee and hip joint replacements accounted for 35% of total arthritis-related procedures during hospitalizations (Mannoni et al., 2003). OA pain often increases depression and decreases life satisfaction (Jakobsson & Hallberg, 2002). The purpose of managing OA is to relieve pain and improve function and quality of life (American Academy of Orthopaedic Surgeons, 2003). Although pharmacological treatments are considered to be a typical approach to managing OA, older adults are at high risk for adverse events or side effects associated with medications (Kolasinski et al., 2005), which highlights the need to identify alternatives to a solely pharmaceutical approach to treatment of OA in older adults (Berman et al., 2004). Nonpharmacological approaches have been shown to reduce pain, improve function, and mitigate emotional problems due to pain in chronic pain patients (Dominick et al., 2004). Research has shown that many older adults with OA are interested in nonpharmacological pain therapies (Konvicka, Meyer, McDavid, & Roberson, 2008). Researchers have identified the need for evidence-based interventions to address the broad range of biophysical and psychosocial difficulties experienced by older adults with OA (Rizzo, 2009). Yoga is one of the several nonpharmacological pain therapies that address physical and psychosocial components and have demonstrated effectiveness in treatment of OA (Hurley & Scott, 1998; Kolasinski, 1999). Yoga is a popular alternative form of mind-body therapy (Chukumnerd, Hatthakit, & Chuaprapaisilp, 2011) that involves a combination of physical postures (asanas), breathing (pranayama), deep relaxation (savasana), and meditation (Nayak & Shankar, 2004). The possible therapeutic benefits of yoga have been studied for a variety of medical conditions; yoga has been associated with improved health outcomes in research trials, in particular for people with hypertension (Patel & North, 1975), epilepsy (Lundgren, Dahl, Yardi, & Melin, 2008), multiple sclerosis (Oken et al., 2004), carpal tunnel syndrome (Garfinkel et al., 1998), cancer (Carson et al., 2007), back pain (Sherman, Cherkin, Erro, Miglioretti, & Deyo, 2005), and depression (Shapiro et al., 2007). Yoga is also effective in treating various forms of arthritis (Garfinkel & Schumacher, 2000), including OA (Garfinkel, Schumacher, Husain, Levy, & Reshetar, 1994; Kolasinski et al., 2005; Krishnamurthy & Telles, 2007) and rheumatoid arthritis (Badsha, Chhabra, Leibman, Mofti, & Kong, 2009; Bosch, Traustadóttir, Howard, & Matt, 2009; Dash & Telles, 2001). In particular, studies of yoga treatment for OA (Garfinkel et al., 1994; Kolasinski et al., 2005) and carpal tunnel syndrome (Garfinkel et al., 1998) have shown significant alleviation of musculoskeletal pain during activity. In addition to pain reduction, yoga has been associated with significant improvement in range of motion and function, decreased tenderness (Garfinkel et al., 1994), and alleviated depression (Krishnamurthy & Telles, 2007). A few studies have been conducted to determine the effect of yoga in people with OA (Bukowski, Conway, Glentz, Kurland, & Galantino, 2006; Garfinkel et al., 1994; Kolasinski et al., 2005; Taibi & Vitiello, 2011), but only one (Garfinkel et al., 1994) used a randomized controlled trial. These studies have contributed to the body of evidence demonstrating positive health benefits of yoga (Ross & Thomas, 2010). A knee OA study (Kolasinski et al., 2005) reported that an 8-week yoga program was beneficial in reducing pain and disability and improving physical functioning, and a hand OA study (Haugen, Slatkowsky-Christensen, Lessem, & Kvien, 2009) noted improvement in finger tenderness and finger range of motion, whereas a study of general arthritis (Sharma, 2005) reported no improvements as measured by responses to their symptom self-report instrument. The studies reported in the literature include relatively small samples and scope, different doses of yoga, poor statistical power, lack of randomization, unclear selection criteria, and/or short duration (Haaz & Bartlett, 2011). They have also differed regarding frequency and duration of yoga practice, as well as yoga styles and content of yoga sessions (Haaz & Bartlett, 2011). A growing body of research suggests that yoga intervention is accepted by older adults and may reduce OA pain (Kolasinski et al., 2005). However, limited studies have reviewed yoga for the treatment of chronic pain in older adults (Morone & Greco, 2007), and these demonstrated methodological limitations, as well as lack of randomization, unclear inclusion/exclusion criteria, and short duration (Haaz & Bartlett, 2011). Kolasinski et al. (2005) identified that yoga may provide a feasible treatment for previously yoga naïve, obese patients older than 50; they reported that an 8-week yoga intervention reduced pain levels, improved physical function, and prevented disability caused by knee OA. The study concluded that yoga can be a feasible treatment for people 50 and older who had not participated in yoga previously and can provide pain reduction and disability caused by OA. Some older adults are unable to participate in regular yoga classes because they are required to stand while doing certain yoga poses. They may feel insecure due to decreased balance ability and increased fear of falling (Rejeski, Brawley, Ettinger, Morgan, & Thompson, 1997). Chair yoga is a gentle form of yoga that is practiced sitting in a chair or standing and using a chair for support. Chair yoga is appropriate for older adults with OA who are unable to participate in regular standing yoga or other exercise. It is particularly safe to practice, easy to learn, and not likely to lead to falls. It is often used by older adults who need the security of sitting in a chair; it requires less physical strength than a strenuous exercise, and it can be modified to allow frail older adults to practice individually or in groups. Although many older adults have been practicing chair yoga and the efficacy of chair yoga has been identified, no study has used chair yoga exclusively for measuring reduction of pain and disability and improvement in function in older adults with OA. The chair yoga program intervention in this study, designed for older adults with OA, was developed by Kristine Lee, a yoga instructor with more than 20 years of experience. Participants came to the yoga studio located in the University College of Nursing and received the 45-minute sessions. The Sidebar provides an overview of each of the four sections of the yoga intervention. Because this intervention was only for older adults with OA, careful attention was paid to the stress on joints and connective tissue, as well as consideration of range of motion of joints. Will older adults with OA who participate in an 8-week chair yoga session demonstrate improvement in pain intensity, stiffness, physical function, and emotional well-being as measured by scores on the Western Ontario and McMaster Universities Osteoarthritis Index (WOMAC; Bellamy, Buchanan, Goldsmith, Campbell, & Stitt, 1988) and the Center for Epidemiologic Studies Depression Scale (CES-D; Radloff, 1977) at baseline, midpoint, and end of intervention? What benefits are reported by older adults diagnosed with OA after participating in an 8-week chair yoga intervention? The study was approved by the University’s Institutional Review Board. Study participants (N = 10) were recruited. Participants in the chair yoga group attended 45-minute chair yoga sessions biweekly for 8 weeks, for a total of 16 sessions. The group was led by a certified yoga instructor who was knowledgeable and experienced in chair yoga sessions. Chair yoga was performed while sitting in a chair equipped with arms for easy access to sitting and standing. Participants in this group sat during the entire 45-minute yoga session. The WOMAC was completed by participants before the intervention, at midpoint (Session 8), and at the end of the intervention (Session 16). On completion of the yoga sessions, participants were invited to participate in a focus group to report the perceived effects of chair yoga. Participants received a $10 gift card after the focus group session. Ten participants were recruited by placing flyers and announcements at the University Continuing Education Center and at an independent living facility in south Florida. Each participant met the following inclusion criteria: (a) age 65 and older; (b) living in the community and noninstitutionalized at the time of the study; (c) diagnosed by a health care professional as having OA in one or more joints (knees, hips, lower back, neck, fingers, thumb, and/or big toe); (d) having chronic pain at least 15 days of the month at a level of 4 on pain scale of 1 (no pain) to 10 (excruciating pain); (e) not currently participating in yoga or other nonpharmacological pain therapies; and (f) able to speak, read, and understand English. Exclusion criteria were: (a) severe cognitive impairment or (b) inability to come to the research site weekly. This study was supported by a university mentoring grant that subsidized the cost of the yoga sessions. Participants were offered the opportunity to continue chair yoga sessions led by the same instructor after the study was conducted. The participants voted to postpone continuation of chair yoga until they returned to Florida from their homes in other states. Therefore, the chair yoga program was scheduled to resume August 22, 2011, at a participant cost of $6 per session. Data consisted of participants’ scores on the WOMAC Index and the CES-D at baseline, mid-intervention, and end of intervention, and participant responses in the focus group session. WOMAC. The WOMAC (Bellamy et al., 1988) consists of 24 items in three subscales: pain (5 items), stiffness (2 items), and physical function (17 items). Response choices are offered on a Likert-type scale of 0 to 4. Scores for items in each of the three subscales are summed, with possible ranges as follows: pain = 0 to 20, stiffness = 0 to 8, and physical function = 0 to 68. Higher scores indicate worse pain, stiffness, and functional limitations (Bellamy et al., 1988). Internal consistency (Cronbach’s alpha coefficient = 0.86) and test-retest reliability (Kendall’s tau c statistic = 0.68) have been reported as moderate to excellent for pain. CES-D. Depressive symptoms were measured with the CES-D (Radloff, 1977). The CES-D is used to assess the degree of depressive symptoms over the past week but does not identify the diagnostic category of depressive disorder. The CES-D consists of 20 items using a 4-point, Likert-type scale of 0 (rarely) to 3 (all of the time; 5 to 7 days). Scores can range from 0 to 60, with a higher score indicating a higher level of depressive symptoms. A score greater than 16 (cut-off score) indicates significant symptomatology in need of further assessment. High Cronbach’s alpha coefficients of 0.85 for adults without a psychiatric diagnosis and 0.90 for adults with a psychiatric diagnosis have been reported (Radloff, 1977). The CES-D has also been tested with community samples of older adults (Krause, 1986), as well as with populations with arthritis (Blalock, DeVellis, Brown, & Wallston, 1989). What did you experience by participating in the 8-week chair yoga intervention? Was the chair yoga program helpful in managing OA? The focus group session was audiorecorded and professionally transcribed. The transcription was analyzed by the two authors to identify emerging themes. Descriptive data analysis was performed to identify sample characteristics. To address the first research question, one-way repeated measures of analysis of variance (ANOVA) were performed to compare baseline, midpoint, and final data with the within-subjects (time) factor to compare scores on the pain, stiffness, physical function, and depressive symptoms subscales. Greenhouse-Geisser adjusted degrees of freedom were used to evaluate interaction effects when appropriate. Significant ANOVA interactions were examined using the Tukey procedure (Stevens, 2002) as a post-hoc test to determine which of the contrasts among three time points were significant: (a) baseline versus 4 weeks, (b) 4 weeks versus 8 weeks, and (c) baseline versus 8 weeks. To address the second research question, data from the focus group discussions were analyzed using thematic analysis. The researchers were present at the focus group session, listened to the recordings, and read and reread the transcript. Analysis of the collected data proceeded using a theme-based content analysis of the narrative data composed of descriptions of experiences of the yoga intervention reported by the participants in the focus group session. The two researchers who conducted the focus group made field notes concerning attitudes, word emphasis, and body language of participants. Each of the four researchers in the study read and reread the transcripts of the focus group discussion, then met to discuss individual findings and reach consensus regarding the meaning of the focus group content and to extract themes. The age range of participants in this study was 71 to 81 (mean age = 77, SD = 3.6 years). Of the 10 individuals who agreed to participate, 7 (70%) completed the chair yoga sessions. Various reasons were given by those who withdrew (e.g., “I had an extremely painful reaction to the first session in my shoulder and neck” [reported by a participant with cervical spine stenosis, whose physician recommended she not continue in the presence of pain], “I cannot make time for these sessions as I have a lot of other appointments and obligations,” and “I have other things to do”). Characteristics of the 7 participants who completed all sessions are presented in Table 1. Six reported having had chronic pain associated with OA for more than 1 year. Three participants reported having experienced lower back pain, and 2 reported having experienced knee pain. In response to the question, “How much does your chronic pain affect your life?” (0 = no effect at all to 9 = severely affects my life), 2 participants gave a response of 5 or higher. Three participants reported taking over-the-counter medications, such as acetaminophen (n = 2) or aspirin (n = 1). Data from the 7 program completers were analyzed using a one-way repeated measures ANOVA. To address the first research question, frequencies, means, standard deviations, F, and significance levels for pain, stiffness, physical function, and depressive symptoms by time (baseline, midpoint [4 weeks], and final [8 weeks]) are presented in Table 2. Higher scores on the WOMAC indicate worse pain, stiffness, and functional limitations (Bellamy et al., 1988). ANOVA showed a statistically significant difference of 15.5 points in mean scores for physical function, F(1, 3) = 17.1, p = 0.03, indicating that physical function improved from baseline to midpoint to final. ANOVA showed a statistically significant difference of 2.4 points in mean scores for stiffness, F(1, 5) = 6.5, p = 0.05, decreasing from baseline to midpoint to final, indicating that stiffness was reduced after chair yoga sessions. Regarding pain, ANOVA also showed that, although the mean score for pain level declined by 5.8 points from baseline to midpoint to final, the overall differences in mean scores for pain were not statistically significant, F(1, 4) = 6.3, p = 0.07. In addition, ANOVA showed that, although the mean score for depressive symptoms declined from baseline to midpoint to final, the overall differences in mean scores for depressive symptoms were not statistically significant, F(1, 1) = 100, p = 0.06. Tukey post-hoc comparisons were conducted for stiffness and physical function to determine which of the comparisons were significant (baseline versus midpoint [4 weeks], midpoint versus final [8 weeks], baseline versus final). For stiffness, the mean score at baseline (3.4, SD = 2.02) was not significantly different from the mean score at midpoint (2.8, SD = 1.54), p = 0.08. The mean score at midpoint was not significantly different from the mean score at final (2.3, SD = 1.5), p = 0.091. The mean score at baseline was also not significantly different from the mean score at final, p = 0.064. For physical function, the mean score at baseline (22, SD = 12.9) was not significantly different from the mean score at midpoint (18, SD = 6.51), p = 0.091. The mean score at midpoint was significantly different from the mean score at final (13, SD = 8.18), p = 0.05, which indicated that physical function improved from midpoint to final. The mean score was also significantly different (9 points) at baseline and final, p = 0.046. Analysis of the data from the focus group discussion yielded three overall themes regarding their experience in the chair yoga intervention and their perceptions of the major benefits of chair yoga: Pain Reduction and Improved Mobility, Feeling of Security, and Improvement in Sense of Well-Being. This pilot study examined the effect of chair yoga on reducing pain and stiffness and improving physical function and depressive symptoms in older adults with OA. Compared with their health status prior to taking the chair yoga sessions, the participants had statistically significant improvement in physical function and stiffness, as measured by the WOMAC Physical Function and Stiffness subscales, which were congruent with results reported in other studies (Chen et al., 2008, 2010; Garfinkel et al., 1994; Kolasinski et al., 2005). In the studies by Chen et al. (2008, 2010), results showed that physical fitness in older adults in the Silver Yoga group had improved significantly by the end of the intervention. Consistent with previous studies (Taibi & Vitiello, 2011), this trial demonstrated that the chair yoga sessions did not produce significant improvement in pain level or depressive symptoms. However, these findings were not congruent with those from other studies (Garfinkel et al., 1994; Williams et al., 2005). Williams et al. noted that significant reductions in pain and disability scores were found for people who completed the yoga classes relative to the educational control group. In the study, 60 adults with chronic low back pain were randomized to weekly yoga classes (90 minutes per week) for 16 weeks or an educational group. Because the 7 participants in the current study attended yoga sessions only twice per week for 45 minutes per session, it is plausible that the lack of significant pain reduction could be due to a suboptimal dose of the yoga intervention (Haaz & Bartlett, 2011) and the small sample. The researchers provided participants with a DVD to practice chair yoga at home since it has been determined that home practice for long-term effectiveness of chair yoga after the intervention is convenient and affordable, without the need for expensive equipment or access to specific facilities (Haaz & Bartlett, 2011). However, only 1 of the 7 participants had a DVD player, and she was not willing to practice on her own. Such issues could be a barrier to home practice of chair yoga by older adults with OA. 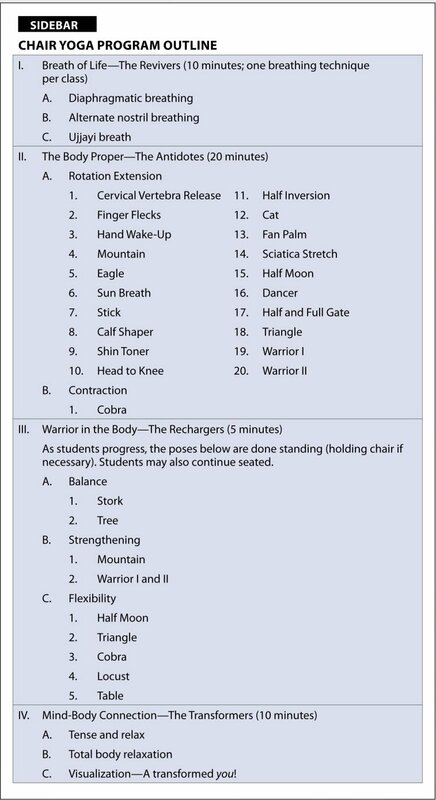 A chair yoga manual developed by Kristine Lee (who has taught yoga since 1997), which includes a picture for each yoga position, will be used in a large-scale study. For those who are not willing to practice chair yoga on their own, it is recommended to practice with other people who have OA instead of home practice. The chair yoga program for this pilot study was designed to provide preliminary data for developing an innovative and evidence-based program for older adults who are unable to attempt more strenuous exercise due to pain, balance, physical function, or simply fear of falling. This study determined the feasibility and safety of practicing chair yoga by older adults with OA. Four participants stated that when they had pain, they sat and did some postures remembered from the program, which they anticipated would reduce pain levels. One participant reported shoulder and neck pain as an adverse effect of participating in chair yoga sessions and left the study during the second session. The results suggest that a supervised 8-week session of chair yoga can be beneficial in improving physical function and reducing stiffness in symptomatic OA patients. The participants in the focus group described chair yoga as a self-healing modality. The focus group participants also reported improvement in breathing, blood circulation, stress, and sleep after 16 sessions of chair yoga. While the WOMAC results did not indicate a statistically significant reduction in pain levels, the benefits of chair yoga that were most frequently reported in the focus group discussion were reduced pain associated with OA and improved mobility, a feeling of security in having a chair, and an improved sense of well-being. The findings from the focus group session provide promising preliminary support for the physical and psychological benefits of chair yoga in older adults with OA. The findings from this pilot study suggest that chair yoga practice may improve physical function and, when tailored to older adults with OA, may offer a cost-effective method to prevent or reduce age-related changes. The small sample is recognized as a study limitation, in that the results lacked power to adequately evaluate the magnitude of the effect of chair yoga on OA. The small sample was likely the cause of the failure to demonstrate significant differences in pain level and depressive symptoms. The lack of a formal manual for chair yoga; differences in chair yoga instructions and yoga instructor; variation in styles, doses, and format (Haaz & Bartlett, 2011); and lack of consistency in the design of the intervention may limit generalizability of the findings. Compared with other studies of yoga for OA, the current study had a relatively high dropout rate (30%). However, this percentage is misleading due to the small sample. One participant withdrew from the study after the first session (“I had an extremely painful reaction to the first session in my shoulder and neck”), which may lead the researchers to review and revise yoga poses to consider the needs of older adults with severe back pain. With the exception of this participant, the dropout rate was not related to adverse events from participating in the chair yoga; the major reason for dropping out was inability to attend sessions due to time constraints. Future studies should use rigorous study methodologies, including larger samples, and randomized controlled trials. Specific plans for the next step in this research include (a) sample size increased to 90 participants to increase power and measure differences within- and between-subject groups, (b) randomized selection of sites from local agencies, and (c) sufficient follow up (e.g., 3 months, 6 months) of monitored home practice, which can be effective for long-term effectiveness in managing OA. Future studies should be conducted with a variety of populations, based on medical conditions and participant characteristics. For example, few studies have addressed patterns of ethnic disparity in the efficacy of yoga, and research is needed to understand perceptions and knowledge about practice of chair yoga by older adults across ethnicities. Older adults with OA can benefit from participation in chair yoga by incorporating yoga practice into a comprehensive pain management plan. The overall recommendation of this pilot study is that more research about chair yoga be conducted for older adults with OA. Gerontological nurses could use a holistic approach for pain management that includes therapies considered complementary-alternative medicine (CAM) with the traditional medical treatments. Chair yoga may be a valuable CAM therapy for nurses to introduce to patients with OA who are unable to attend standing yoga or other exercise programs due to pain, weakness, or fear of falling. More important, gerontological nurses should have sufficient follow up to determine whether a patient with OA can obtain benefits from a chair yoga program. American Academy of Orthopaedic Surgeons. (2003). AAOS clinical practice guidelines on osteoarthritis of the knee. Rosemont, IL: Author. Bellamy, N., Buchanan, W.W., Goldsmith, C.H., Campbell, J. & Stitt, L.W. (1988). 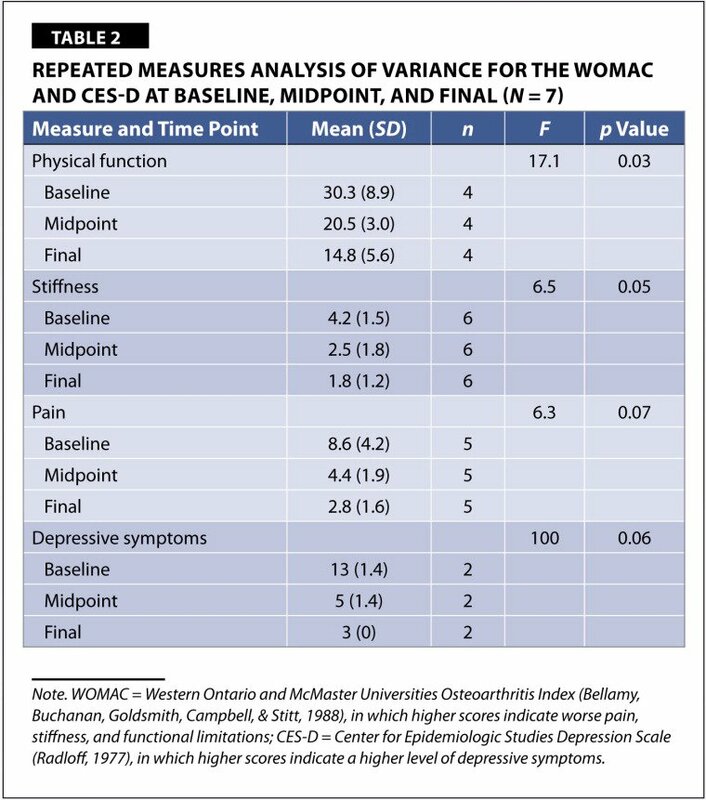 Validation study of WOMAC: A health status instrument for measuring clinically important patient relevant outcomes to antirheumatic drug therapy in patients with osteoarthritis of the hip or knee. Journal of Rheumatology, 15, 1833–1840. Berman, B.M., Lao, L., Langenberg, P., Lee, W.L., Gilpin, A.M.K. & Hochberg, M.C. (2004). Effectiveness of acupuncture as adjunctive therapy in osteoarthritis of the knee: A randomized, controlled trial. Annals of Internal Medicine, 141, 901–910. Bosch, P.R., Traustadóttir, T., Howard, P. & Matt, K.S. (2009). Functional and physiological effects of yoga in women with rheumatoid arthritis: A pilot study. Alternative Therapies in Health and Medicine, 15, 24–31. Burkes, K. (2005). Osteoarthritis in older adults: Current treatments. Journal of Gerontological Nursing, 31(5), 11–19. Dash, M. & Telles, S. (2001). Improvement in hand grip strength in normal volunteers and rheumatoid arthritis patients following yoga training. Indian Journal of Physiology and Pharmacology, 45, 335–360. Garfinkel, M.S., Schumacher, H.R. Jr.. , Husain, A., Levy, M. & Reshetar, R. (1994). Evaluation of a yoga based regimen for treatment of osteoarthritis of the hands. Journal of Rheumatology, 21, 2341–2343. Kolasinski, S.L. (1999). The use of alternative therapies by patients with rheumatic disease. Journal of Clinical Rheumatology, 5, 1–2. Krishnamurthy, M.N. & Telles, S. (2007). Assessing depression following two ancient Indian interventions: Effects of yoga and ayurveda on older adults in a residential home. Journal of Gerontological Nursing, 33(2), 17–33. Peyron, J. & Altman, R. (1992). 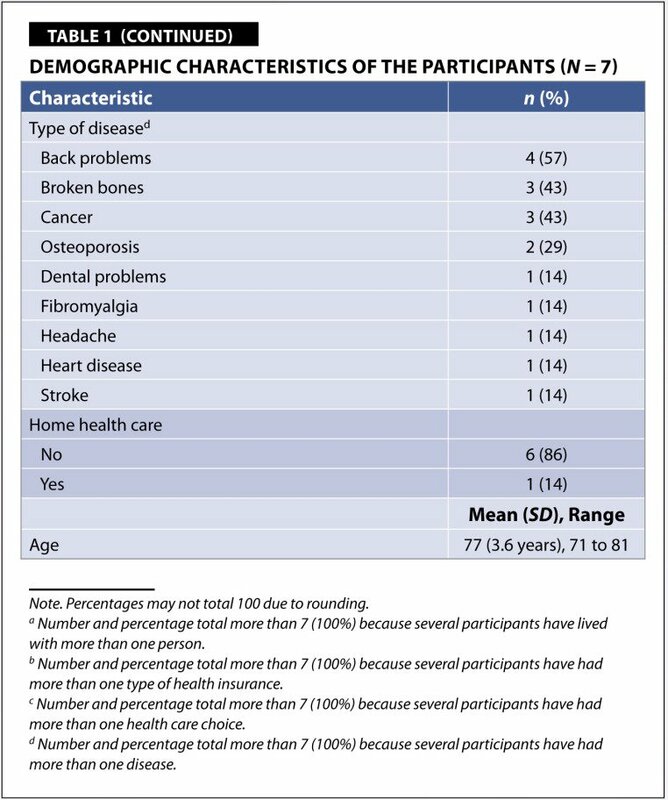 The epidemiology of osteoarthritis. In Moskowitz, R.W., Howell, D.S., Goldberg, V.M. & Mankin, H.J. (Eds. ), Osteoarthritis diagnosis and medical/surgical management (2nd ed., pp. 15–37). Philadelphia: Saunders. Sharma, M. (2005). Effects of a yoga intervention as a supportive therapy in arthritis. Yoga Studies, 4, 12–16. Sherman, K.J., Cherkin, D.C., Erro, J., Miglioretti, D.L. & Deyo, R.A. (2005). Comparing yoga, exercise, and a self-care book for chronic low back pain: A randomized, controlled trial. 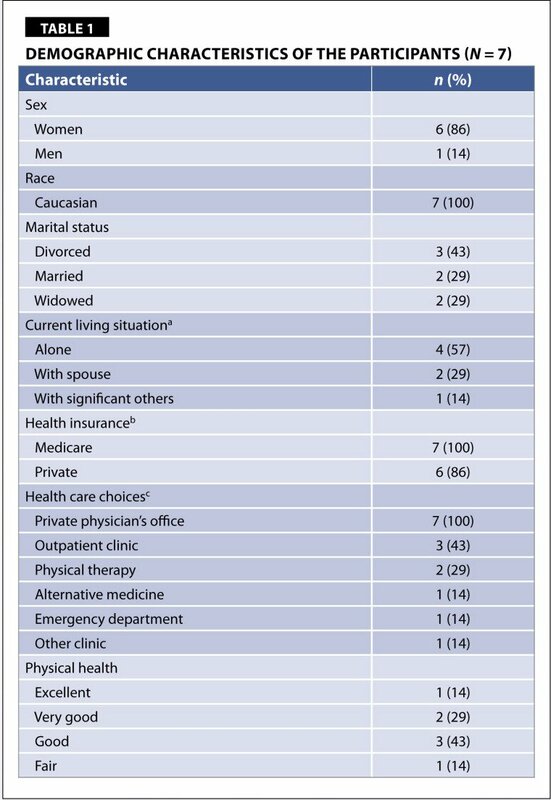 Annals of Internal Medicine, 143, 849–857. Stevens, J.P. (2002). Applied multivariate statistics for the social sciences (4th ed.). Mahwah, NJ: Erlbaum. Vitiello, M.V., Rybarczyk, B., Von Korff, M. & Stepanski, E.J. (2009). Cognitive behavioral therapy for insomnia improves sleep and decreases pain in older adults with co-morbid insomnia and osteoarthritis. Journal of Clinical Sleep Medicine, 5, 355–362. Read the article “Chair Yoga: Benefits for Community-Dwelling Older Adults With Osteoarthritis” by Juyoung Park, PhD; and Ruth McCaffrey, DNP, ARNP, FNP-BC, GNP-BC on pages 12–22, carefully noting the tables and other illustrative materials that are provided to enhance your knowledge and understanding of the content. Read each question and record your answers. After completing all questions, compare your answers to those provided at the end of the quiz. Type or print your full name, address, and date of birth in the spaces provided on the registration form. Indicate the total time spent on the activity (reading article and completing quiz). Forms and quizzes cannot be processed if this section is incomplete. All participants are required by the accreditation agency to attest to the time spent completing the activity. Forward the completed form with your check or money order for $20 made payable to JGN-CNE. All payments must be made in U.S. dollars and checks must be drawn on U.S. banks. CNE Registration Forms must be received no later than May 31, 2014. This activity is co-provided by Vindico Medical Education and the Journal of Gerontological Nursing. Vindico Medical Education is an approved provider of continuing nursing education by New Jersey State Nurses Association, an accredited approver, by the American Nurses Credentialing Center’s Commission on Accreditation, P#188-6/09-12. Identify the prevalence of functional limitation associated with osteoarthritis (OA) in older adults. Discuss the components and use of yoga for treatment of OA in older adults. Describe the methodology used in the study of chair yoga conducted by the authors. Discuss the themes identified by the focus group following implementation of the chair yoga sessions. Describe the limitations of the study. Dr. Park and Dr. McCaffrey disclose that they have no significant financial interests in any product or class of products discussed directly or indirectly in this activity. This pilot study was supported by the Florida Atlantic University mentoring grant (seed grant). All authors and planners have agreed that this activity will be free of commercial bias. There is no commercial support for this activity. There is no non-commercial support for this activity. Park, J. & McCaffrey, R. (2012). Chair Yoga: Benefits for Community-Dwelling Older Adults With Osteoarthritis. Journal of Gerontological Nursing, 38(5), 12–22. Yoga is one of the nonpharmacological pain therapies that address physical and psychosocial components and has demonstrated effectiveness in treatment of osteoarthritis (OA). Although chair yoga was effective in improving physical function and reducing stiffness in older adults with OA, its effect on reducing pain level or improving depressive symptoms was not statistically significant. The focus group discussion yielded three overall themes regarding participants’ experience in the chair yoga intervention and their perceptions of its major benefits: Pain Reduction and Improved Mobility, Feeling of Security, and Improvement in Sense of Well-Being. Do you want to Participate in the CNE activity?